TRESPA® TOPLAB®PLUS or Top Lab is a self-supporting flat panel without integral coved curbs, using an exclusive manufacturing process (including EBC technology) that Trespa International BV has developed and patented, along with a patented cellulose fiber, homogeneously reinforced phenolic thermosetting resin core. Its integrated, decorative surface, manufactured under high heat and pressure, is based on pigmented, electron beam cured resins, is resistant to the most aggressive chemicals and easy to clean and maintain. 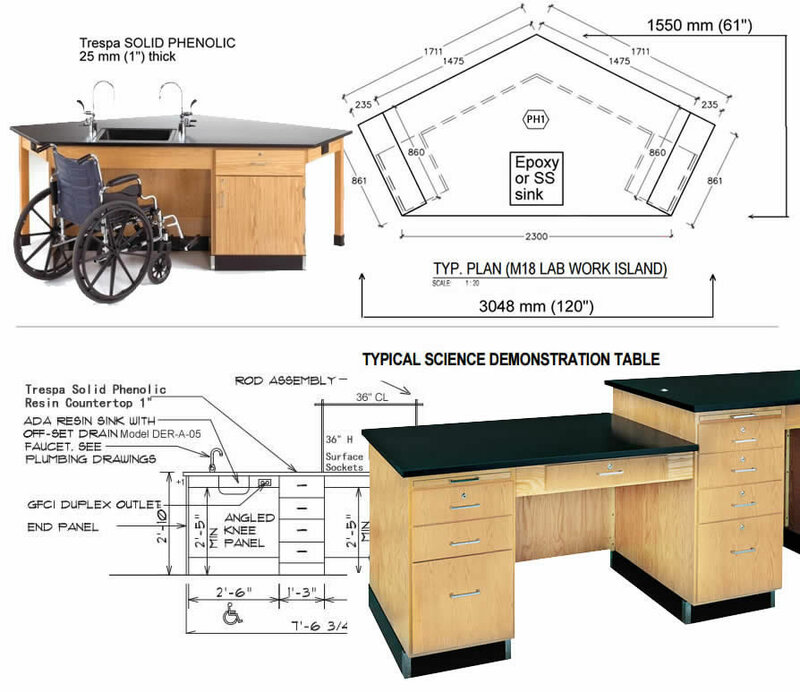 TopLab PLUS can easily be fabricated or cut and formed, allowing an entirely new level of design freedom for applications in chemical, analytical, micro-biological and educational laboratories world-wide. 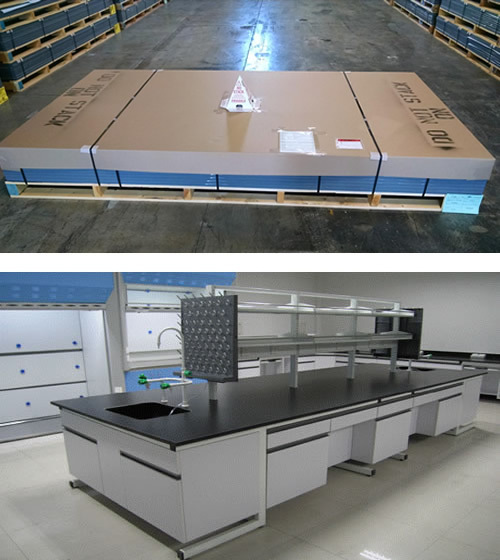 TRESPA® TOPLAB®PLUS should be your first choice in the domestic or international markets for your scientific furniture laboratory work surfaces. TRESPA® TOPLAB®PLUS is certified by the Forest Stewardship Council (FSC) as well as the Programme for the Endorsement of Forest Certification schemes (PEFC), the world's largest forest certification organizations. The solid phenolic panel has an integrated decorative chemical resistant surface based on pigmented, electron beam cured resins - making it nearly invulnerable to damage from harsh chemicals, solvents or other acidic applications and aggressive chemicals. Edge banding or protection is not required as the solid phenolic core is also impervious to chemical attack, and repeated cleaning never detracts from functionality or appearance. All splash materials are cut to size for field application. Our fabricators are experienced personnel and apply the required edge treatment to each exposed edge and corner for personnel protection and ease of handling and cleaning. "The surface of Trespa TLP also resists attack by heat. Continuous exposure to temperatures up to 284F degrees is feasible and exposure of 20 minutes or less to temperatures as high as 356F degrees can also be accommodated." This statement is based on HEAT, not fire from a bunsen burner or open flame. Article Source: http://EzineArticles.com/6752416. With the exclusive use of Trespa's EBC technology, the completely pore-free surface is close to being impervious to all possible materials used in laboratories: radio-isotopes, human tissue and blood samples, bacteria and moulds or micro-organisms. Because of its excellent chemical resistance, performance and hygiene, TRESPA® TOPLAB®PLUS is regularly used in chemical, analytical, micro-biological, biochemical and medical laboratories as well as school and university laboratories. Trespa TLP compression-molded countertops are composed of thermoset resins with cellulose fiber reinforcement for outstanding resistance to chemicals, heat, and stains. The nonporous tops will not rot or rust and are resistant to fungus, bacteria, and are UV resistant. 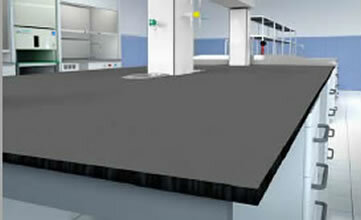 A) "Epoxy resin "Trespa" Laboratory solid surface countertops with invisible seams". B) "Chemical resistant phenolic-composite solid surface countertop with 4" Integral coved backsplash". C) "Trespa Solid black Epoxy resin countertop with bevelled edge and backsplash". The Trespa® TopLab®PLUS product line is enriched with the introduction of T70.0.0 Slate Grey with grey core. The new core provides greater design freedom, while maintaining Trespa® TopLab®PLUS inherent hygienic and chemical resistant properties. 5 x 10 x 3/4"
5 x 10 x 1"
6 x 8 x 3/4"
6 x 8 x 1"
Check with TLS prior to ordering. The following pre-manufactured student tables are available for immediate shipment (max 2 weeks lead time) in Trespa TopLab Plus, Black 1" (25mm) thickness - 1/8" (3mm) bevel exposed edges and radius corners. Contact us regarding delivery schedule, availability, new colors, specifications, and more.